Okay, so no doubt if you have come to this page that means you have just used a Credit Card to do a transaction on GoDaddy and GoDaddy has conveniently recorded your card details and has pushed you into automatic renewal mode of your blog! I have also been there, worried probably more than you because I was registering a domain for a far friend from another friend's credit card. The reason I had to use a credit card was that I used a coupon to get the domain for just Rs.120.54 ($2 approximately) and I didn't have a CC. So, after doing the transaction which happened with no OTP or secure PIN (which otherwise my friend with CC told me has happened for the very first time) I saw the GoDaddy has stored the CC details and was not allowing me to remove it. 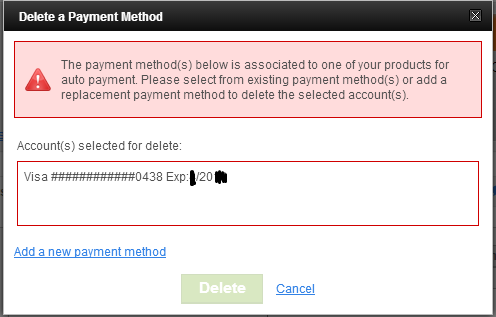 The message which came was something like "Please add an alternate payment method" which meant that I had to provide an alternative CC to remove the first CC! Just like you I searched for a solution with the exact title as of this article and found "solutions" which asked me to delete the first CC by adding another CC or at least one another better blog told me to add a International Debit (which is a sort of solution if the account is yours only and you don't have to worry about someone else viewing those details in your account) which I have explained later in this article. Let me first tell you that though GoDaddy showed above the card details the option of Credit/Debit card, a debit card didn't work. Even my International debit card didn't work; neither a VCC which I generated through my bank account. In essence, any form of card which required verification either through OTP or a password wouldn't work on the portal. However, I had tried these methods and found that GoDaddy initially did store these details but when you try to process the transaction it fails. Voila! This was the solution to my problem and is the solution to your problem too! If it is your own account you can add your International Debit Card and then delete your CC which should be normally deleted immediately or at most in 1 hour. Your Debit card requires verification in form of OTP or password to process the transaction so when GoDaddy will try to automatically renew the domain the transaction will automatically fail so no problem here. However, if you are in my situation where you are doing a friend a favor by another friend's CC and but are not comfortable with your Debit card details stored in someone else' account you can do what I did. I opted to store a VCC card details in my GoDaddy account rather than any actual card! The CC details were removed and you can easily cancel your VCC once you have replaced your CC which the VCC. Even a VCC is protected by an OTP so you don't need to worry about leaving the details or even deleting the VCC manually. Use the VCC anywhere else or do whatever you like to do with it! Learn the complete procedure to add Big Rock domain to Blogger blogspot blogs using blogger custom domain settings. How to obtain second CNAME Record for custom domain from Blogger ? Do you want to know how to get second CNAME record from Blogger to link your custom domain to blog of Blogger? Here is the complete and easy step by step procedure is given on obtaining unique CNAME record for custom domain. Are you looking forward to enable custom domain switching for your blog created in Blogger? Here is the complete procedure on how to start custom domain linking to Blogger’s blog for free. Thank you for this information. Go Daddy is a tenacious company. They managed to get money off my card even after the date had expired. Also, their annual rate inclines sharply with each year. They're not getting another dollar from me.